For reasons of proper performance, safety, and better fuel economy, always maintain recommended tyre infl ation pressures and stay within the recommended load limits and weight distribution. Using Different Tyre Types: Driving your vehicle with different types of tyres is dangerous. It could cause poor handling and poor braking; leading to loss of control. Except for the limited use of the temporary spare tyre, use only the same type tyres (radial, bias-belted, bias-type) on all four wheels. Using Wrong-Sized Tyres: Using any other tyre size than what is specifi ed for the vehicle (page 9-10 ) is dangerous. It could seriously affect ride, handling, ground clearance, tyre clearance, and speedometer calibration. This could cause you to have an accident. Use only tyres that are the correct size specifi ed for the vehicle. Always infl ate the tyres to the correct pressure: Overinfl ation or underinfl ation of tyres is dangerous. Adverse handling or unexpected tyre failure could result in a serious accident. Refer to Tyres on page 9-10 . Use only a Mazda-genuine tyre valve cap: Use of a non-genuine part is dangerous as the correct tyre air pressure cannot be maintained if the tyre valve becomes damaged. If the vehicle is driven under this condition, the tyre air pressure will decrease which could result in a serious accident. Do not use any part for the tyre valve cap that is not a Mazda-genuine part. Inspect all tyre pressures monthly (including the spare * ) when the tyres are cold. Maintain recommended pressures for the best ride, handling, and minimum tyre wear. Refer to the specifi cation charts (page 9-10 ). (With tyre pressure monitoring system) After adjusting the tyre pressure, initialization of the tyre pressure monitoring system is necessary to make the system operate normally. Refer to Tyre Pressure Monitoring System Initialization on page 4-142 . Always check tyre pressure when tyres are cold. Warm tyres normally exceed recommended pressures. Do not release air from warm tyres to adjust the pressure. Underinfl ation can cause reduced fuel economy, uneven and accelerated tyre wear, and poor sealing of the tyre bead, which will deform the wheel and cause separation of tyre from rim. Overinfl ation can produce a harsh ride, uneven and accelerated tyre wear, and a greater possibility of damage from road hazards. Keep your tyre pressure at the correct levels. If one frequently needs infl ating, have it inspected. Rotate tyres periodically: Irregular tyre wear is dangerous. To equalize tread wear for maintaining good performance in handling and braking, rotate the tyres every 10,000 km (6,250 miles), or sooner if irregular wear develops. During rotation, inspect them for correct balance. (Without temporary spare tyre) Because your vehicle is not equipped with a spare tyre, you cannot do a tyre rotation safely with the jack that comes with your vehicle. Have an expert repairer, we recommend an Authorised Mazda Repairer perform tyre rotation. Do not include (TEMPORARY USE ONLY) spare tyre in rotation. After rotation, infl ate all tyre pressures to specifi cation (page 9-10 ) and inspect the wheel nuts for tightness. 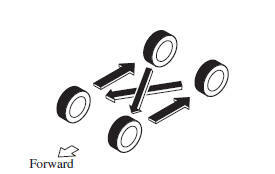 Rotate unidirectional tyres and radial tyres that have an asymmetrical tread pattern or studs only from front to rear, not from side to side. Tyre performance will be reduced if rotated from side to side. Always use tyres that are in good condition: Driving with worn tyres is dangerous. Replace all four tyres at the same time: Replacing just one tyre is dangerous. It could cause poor handling and poor braking resulting in loss of vehicle control. Mazda strongly recommends that you replace all four tyres at the same time. If a tyre wears evenly, a wear indicator will appear as a solid band across the tread. Replace the tyre when this happens. You should replace the tyre before the band crosses the entire tread. Inspect the temporary spare tyre at least monthly to make sure it is properly infl ated and stored. The temporary spare tyre condition gradually deteriorates even if it has not been used. The temporary spare tyre is easier to handle because of its construction which is lighter and smaller than a conventional tyre. This tyre should be used only for an emergency and only for a short distance. Use the temporary spare tyre only until the conventional tyre is repaired, which should be as soon as possible. Refer to Tyre on page 9-10 . Do not use your temporary spare tyre rim with a snow tyre or a conventional tyre. Neither will properly fi t and could damage both tyre and rim. The temporary spare tyre has a tread life of less than 5,000 km (3,000 miles). 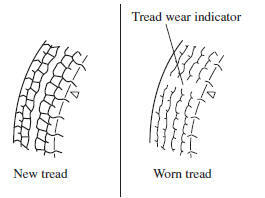 The tread life may be shorter depending on driving conditions. The temporary spare tyre is for limited use, however, if the tread wear solid-band indicator appears, replace the tyre with the same type of temporary spare (page 6-47 ). Always use wheels of the correct size on your vehicle: Using a wrong-sized wheel is dangerous. Braking and handling could be affected, leading to loss of control and an accident. When replacing a wheel, make sure the new one is the same as the original factory wheel in diameter, rim width, and offset (inset/outset). Proper tyre balancing provides the best riding comfort and helps reduce tread wear. Out-of-balance tyres can cause vibration and uneven wear, such as cupping and fl at spots.